"You could have made a lot of money buying platinum and selling gold since Lehman Brothers," said Philip Klapwijk, executive chairman of GFMS today, answering analyst questions after launching the precious-metals consultancy's new Gold Survey 2012. The white metal recovered faster than gold over the next 32 months. But then, it needed to, having dropped two-thirds of its dollar price between March and December 2008. And since last summer, platinum has slipped back below the gold price per ounce – something seen on three brief trading days amid the global meltdown following Lehmans' collapse. Prior to that, you have to go back to the recession starting 1991...the peak of the "strong dollar" which spooked the world into thinking deflation was looming in 1983-84...the global stock market's once-in-a-generation low of 1982...and gold's big tops of Jan. 1980 and Dec. 1974 to find platinum cheaper than gold price. 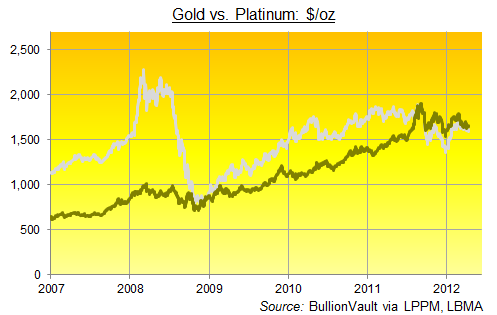 GFMS's Klapwijk said today it was "interesting" to see gold overtake platinum prices so quickly again. But terrifying – or very worrying at least – might be closer to it. "There's a case to be made for the white metal trading at a premium to the gold price," as Klapwijk said. Their scarcity in the earth's crust is about the same (between three to six parts per billion), but platinum is very much more diffuse. On the demand side, it's plainly more "useful" than gold too, with one third of annual output going to industry and another third going to make auto-catalysts. Fully 85% of gold demand, in contrast, is for store-of-value or adornment. But there's the rub. Gold is preferred by the vast majority of investors, as Klapwijk noted, a fact you could attribute to 5,000 years of constant investment use, everywhere and by every culture which has discovered it – a history which gold shares with silver alone. But Klapwijk's second point was stronger than that. Instead, he noted gold's relative lack of industrial use. And that makes it a far better defense against the kind of economic turmoil witnessed in the mid-70s, early '80s, in 2008 and again since summer 2011. Over the last 9 months in particular, Europe's economic crisis has affected its vehicle demand, GFMS said, and that means lower demand for diesel engines and thus platinum-based catalysts. Gold may have suffered similarly lower jewelry demand in the West, but euro-zone investors have stepped in to pick up the slack. And according to GFMS today, together with pretty much everyone who studies this market, their Asian counterparts are buying gold with both hands regardless. Why is Turkey Turning to Bullion?